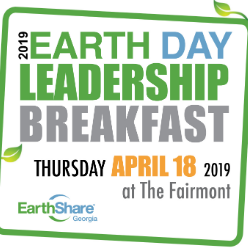 EarthShare Georgia's annual Earth Day Leadership Breakfast brings together the business and environmental communities for a seated breakfast and a morning of networking, learning, and exploring sustainability topics. This year's Breakfast will feature keynote speaker Beth Wytiaz, Global Environmental Operations Manager at Bank of America. A lively panel discussion about land conservation issues will follow Beth's presentation focusing on how environmental sustainability has a direct relationship to building stronger and more resilient communities. Panelists include: Tina Arnold, Nathaniel Smith, Judy Yi, and moderated by Walt Ray. EarthShare Georgia's annual Earth Day Leadership Breakfast brings together the business and environmental communities for a seated breakfast and a morning of networking, learning, and exploring sustainability topics. This year's Breakfast will feature keynote speaker Beth Wytiaz, Global Environmental Operations Manager at Bank of America. A lively panel discussion about land conservation issues will follow Beth's presentation focusing on how environmental sustainability has a direct relationship to building stronger and more resilient communities. Panelists include: Tina Arnold, Nathaniel Smith, Judy Yi, and moderated by Walt Ray.